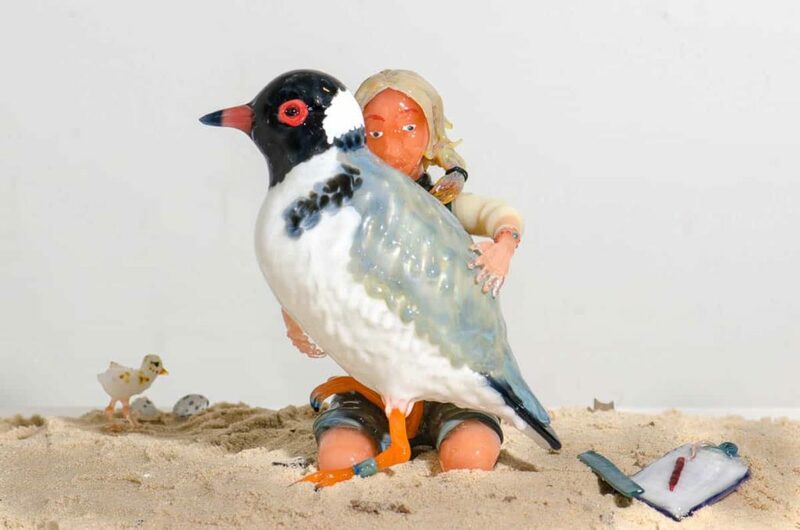 Mark Eliott, Hooded Plover and Jodie Dunn, 2014, photo: Dylan Esguerra The Hooded Plover or Thinornis rubricollis and her chicks – reared in the sand (the predominate ingredient in borosilicate glass from which this work was flame-blown and sculpted), struggle to survive on a beach beset by foxes, dogs, Ravens, vehicles, gulls and heavy feet. In a miracle of cross-species empathy, Plovers loom large for Jodie Dunn – a thoughtful Homo sapien who dedicates much of her time to their survival. Mark Eliott, Little terns, 2013, glass, photo: Richard Weinstein. 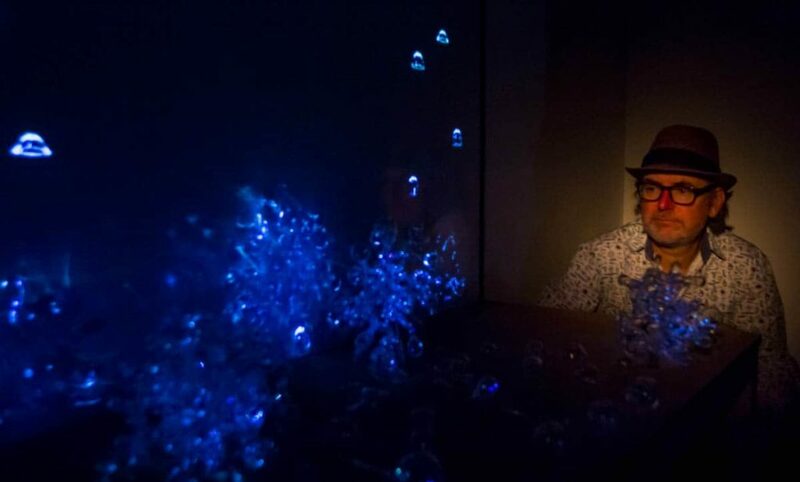 This was a work exhibited in the Glass Lifeforms exhibition Pittsburgh US 2013. photographers were Mark Eliott and Roberto Cela Improvisation in Red Spikes was made between 2007 and 2012. 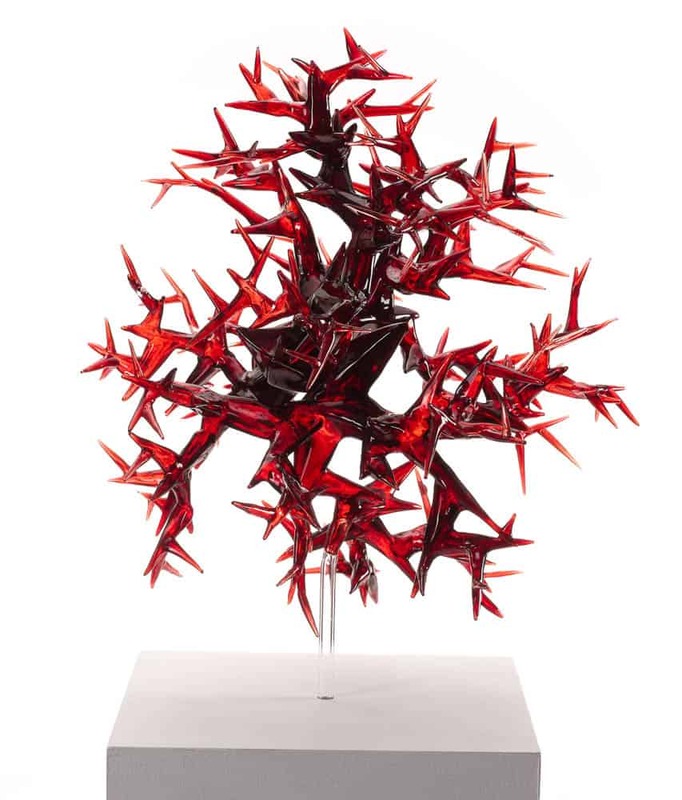 Mark Eliott, Improvisation on Red Spikes, 2007-2012, glass, photo: Richard Weinstein Today synapses snapped. One thing led to another: The brain grew a thousand neurons, the body grew a thousand nerve endings- like coral: almost crystalline. The heart broke into a thousand shards- piercing the mind from the inside, then took flight – a thousand birds on the wing: moving as one. From my ‘Slow Growth improvisation’ series, this work took shape—blowing glass—one bubble into the next over a 5 year period. It evolved into a crystallization of grief at my father’s passing. Over time the grief dilutes into smaller crystals which still hurt but become lighter like the wings of birds. 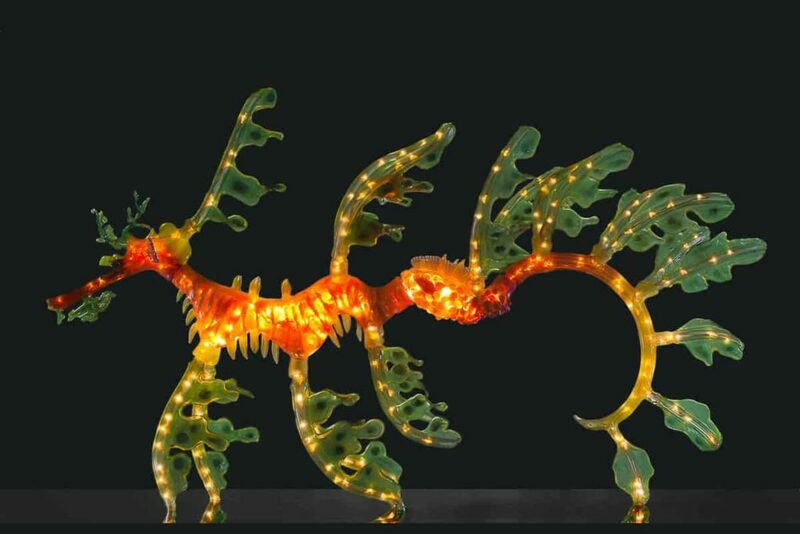 Mark Eliott, Light Dragon, 2016, with lighting by Johannes Muljana, photo: Pamela Lee Brenner and Johannes Muljana “Light Dragon represents to me, the sublime musical and luminous form of the Leafy Sea Dragon as it sails through the seaweed forests of Southern Australian waters. The male nurses the eggs on its tail until they hatch. This is related to my previous work Phycaduras Eques but is larger and hollow blown with a focus on translucence and luminosity assisted with internal LED lighting by Johannes Muljana. In this work I am influenced by the impossible yet bold 19th century project to accurately represent marine organisms which was undertaken by the father and son team of bohemian glassblowers: Rudolph and Leopold Blaschka. I also wish to acknowledge the possible yet brave project undertaken by scientists in the current era, to save these species which now face a variety of environmental challenges to their survival. How did the idea begin of making animations? The idea had been in the back of my mind for a while, but I shelved it in the unlikely projects department and completely forgot about it. 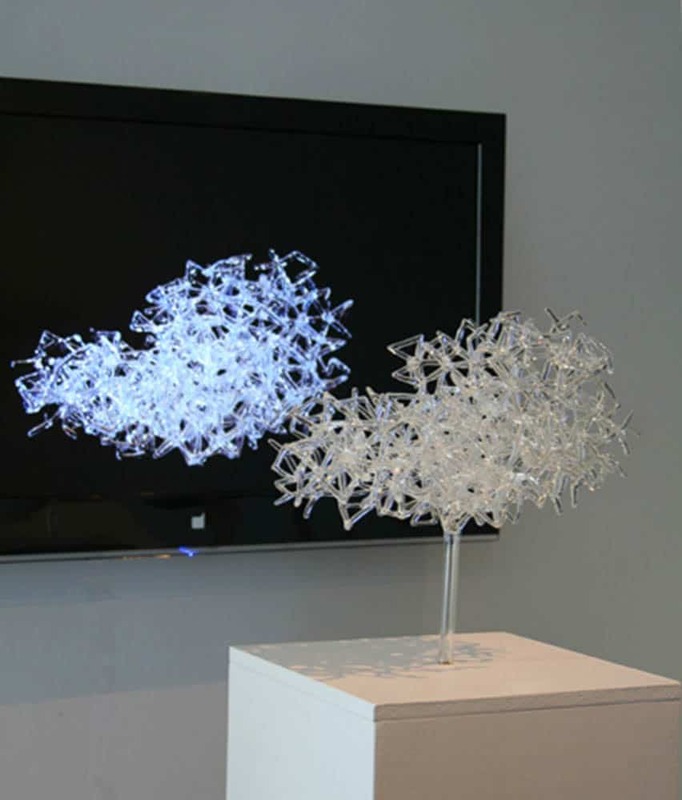 In 2008, I began a Research Masters in the glass studio at Sydney College of the Arts. While in Errol Bailey’s theory class, I met Jack McGrath who was doing a masters in digital media. We discussed the idea of animating flame-worked glass using techniques similar to those used in Claymation. Since Jack was already making animations and installations and my research topic was creative improvisation, it was easy for us both to segue into this unexpected experimental project. In the process we developed a hybrid form of animation using stop motion photography of molten glass and digital compositing. Others helped in this project including artist/compositer, Vanessa White, and my late father, the actor, Tim Eliott. 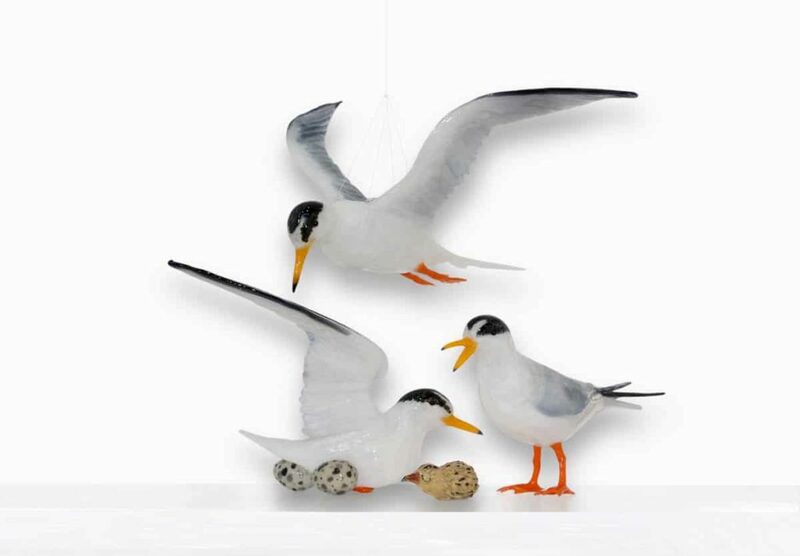 The studio model works on the basis of art works produced for sale in galleries. Can you sell the animations? The answer to this is a work in progress. Most of my income is produced in the studio making glass objects for exhibition and sale as well as teaching. Jack McGrath is now a professional filmmaker and educator. So far we have been treating the flame-glass animation project as an exciting experimental creative outlet rather than as a source of direct financial reward, though we believe it has great potential to generate income and we are seeking funding for future projects. What would you like visitors to get out of your work? I would like visitors to engage with the stories on which many of the animations and sculptures are based. In addition, there is a theme running through the work, which is the sub-narrative of process and materiality associated with working in glass and the intimacy one can develop over a lifetime’s relationship with this dynamic, malleable and often unpredictable substance. Can you give us a glimpse of your world? I was born in New Zealand, though my teenage years and adult life as an artist have been based in Australia—mostly in Bondi, Sydney where I now live with my wonderful partner and our two children, who are both at University studying economics and science. It was in Bondi that the animated story Dr Mermaid and the Abovemarine first emerged. This is a fantasy which particularly appeals to children, yet I think its underlying themes are universal. These include preserving fragile marine ecosystems, improving human respect for other organisms, empowerment of women and the search for a sense of belonging to place through story. 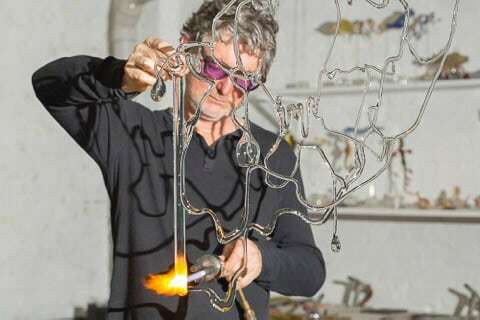 I enjoy participating in community projects and arts events such as Sculpture by the Sea and teaching at the Glassworks in Canberra where I am also undertaking a PHD part time at the Australian national university. I also like to perform with The Agar dish live-Art group and exhibit with Kirra galleries, Glass Artists Gallery and Flying Pig Precinct. Currently I have a studio at 107 Projects, an artist-run, multi-purpose venue in Redfern, Sydney. I am a musician and have been unable to give up my passion for saxophone in spite of a busy career in the visual arts. 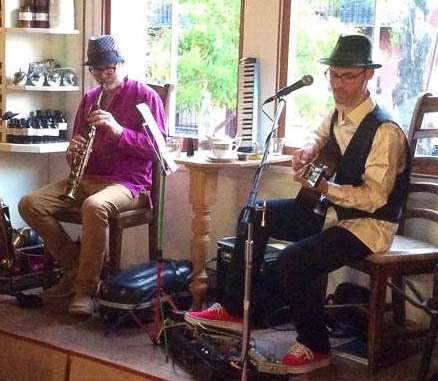 Currently I perform in a duo with singer-songwriter Ben Fink at Marcels Exlounge café, Bronte Beach. There are plenty of things in the world that concern me such as increasing gaps between rich and poor, a common lack of respect for indigenous cultures and people who try to thwart action on climate change. I also get angry about Sydney’s cuts to tertiary arts education, and Australia’s treatment of asylum seekers who arrive by boat, but I try not to lose sight of the extraordinary beauty of the world, its people and the greater family of life to which we all belong. How can people see these animations? 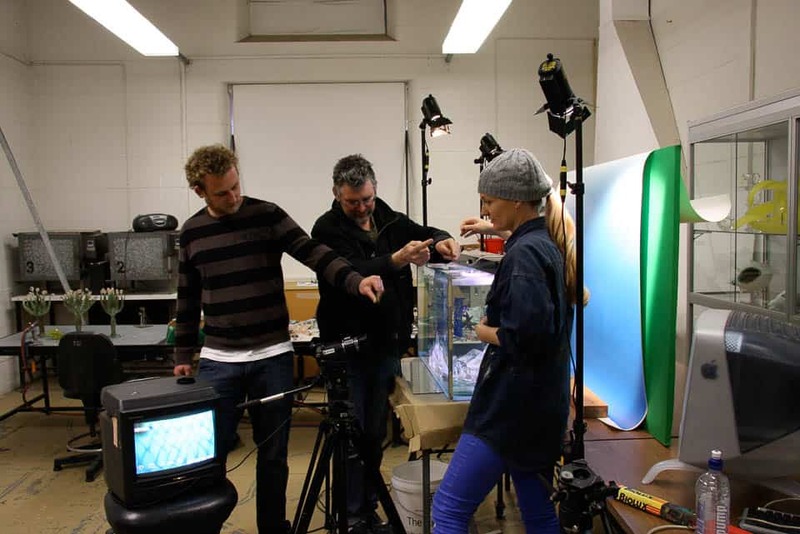 Dr Mermaid and the Abovemarine from Jack McGrath on Vimeo. 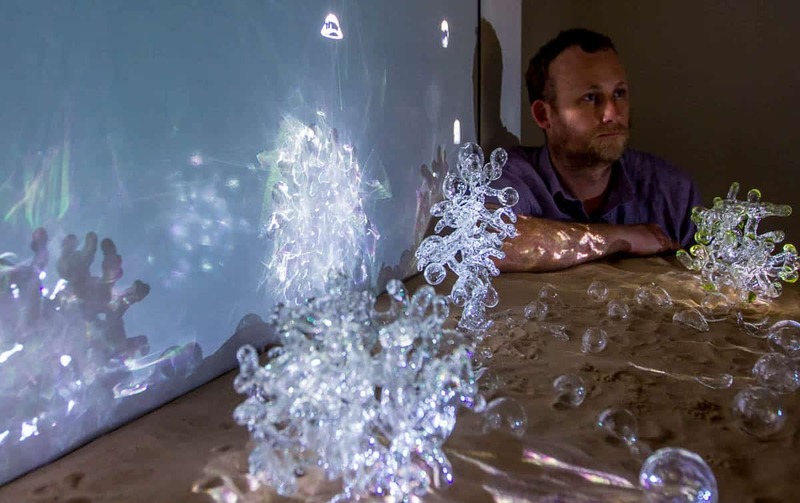 ‘Experiments in living glass #1’, installation video from Jack McGrath on Vimeo. Glass Flame-ation Bondi – the workshop from Jack McGrath on Vimeo. Incredibly fascinating work and mixing of mediums. Pure delight and true innovation in the contemporary creative world!